More than half a century after Frank Lloyd Wright issued his caustic indictment of ‘inferior desecraters’, many architects continue to dismiss decorating as a second-class discipline lacking the intellectual and artistic rigor or their own heroic pursuit. 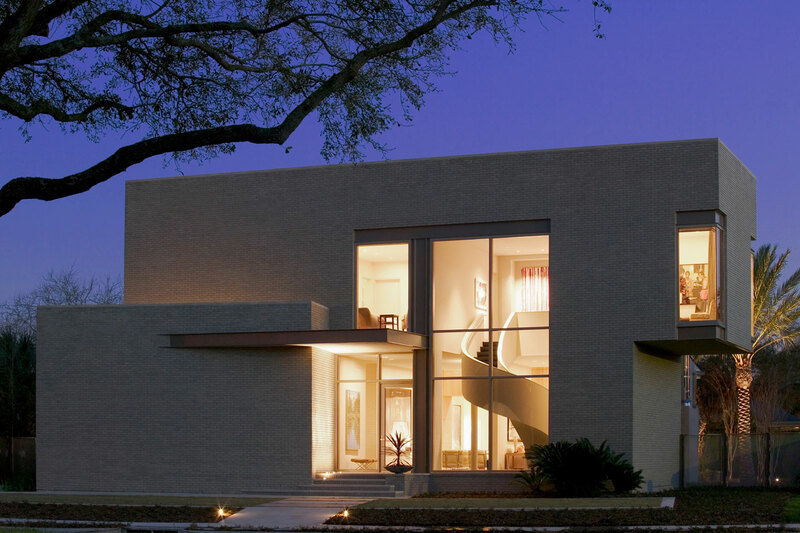 New Orleans architect Lee Ledbetter has little patience for such antiquated chauvinism. He rejects the idea that a serious architect cannot be a dedicated decorator as well. Ledbetter’s commitment to both disciplines is expressed with particular eloquence in the house he designed for…a New Orleans patron who has assembled one of the most important photography collections in the South. Answering to two callings, the New Orleans architect and decorator fashions a superb residential light box for a photography collector…The decorating here matches the architecture and artwork in confidence and complexity…Ledbetter’s reputation as a serious architect has not been compromised by his dual identity as a skilled decorator. The sculptural staircase throws an emphatic curve into the rectilinear scheme. Ledbetter also used antiques to temper the cool white walls and black slate floors.